While it is always important to make sure that the cat enclosure you are purchasing is designed to be safe and secured at all times, there is nothing wrong with looking for something that has a bit more character as well. This is why many people are turning to Trixie Pet Products for their cat enclosures, as they have become quite renowned for selling enclosures that are visually appealing while also being very reliable. 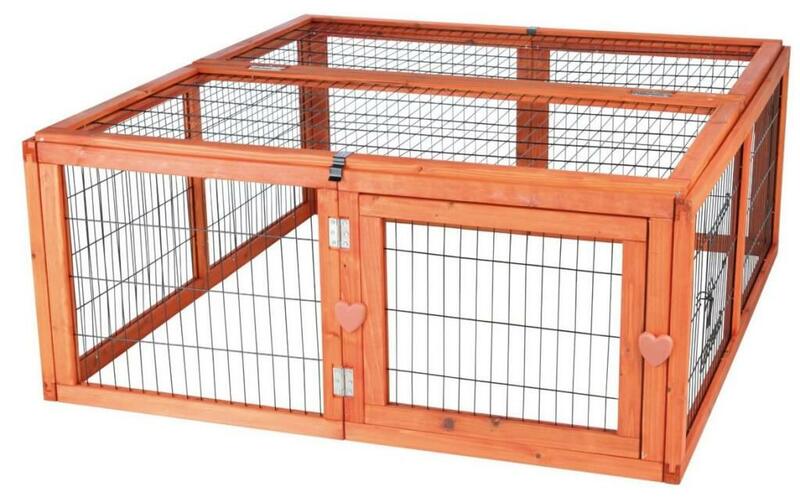 Trixie Pet Products do have a wide selection of enclosures, so it’s important to know which one is right for you. Here we will take a look at their three most popular models and attempt to answer any questions you have about them so you can be sure you have purchased the right enclosure for you are your cats. 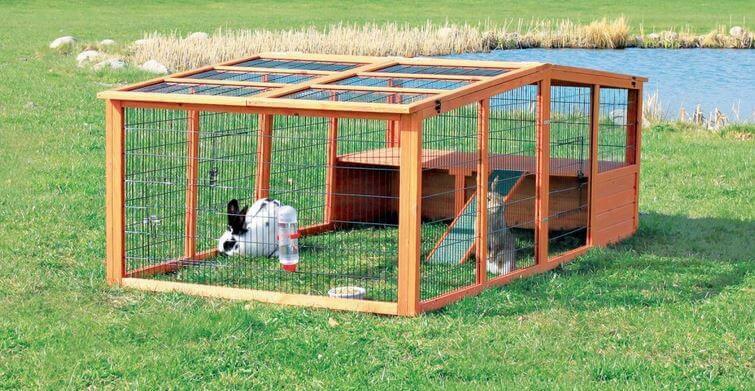 In terms of design, this cat enclosure from Trixie Pet Products has a lot in common with a rabbit hutch. The mesh covering on the enclosure is nice and strong to prevent cats from trying to escape. It has is able to cover plenty of floor space so then your cats are still able to roam around while they are outside without being able to get too far away. This enclosure also has a nice hinged door so then you can just slide it open and allow yours cats to get in and out easily. 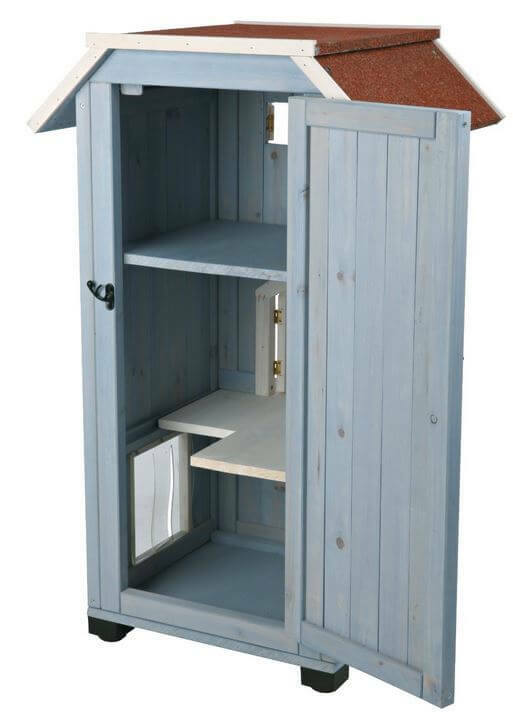 Some customers who have bought this enclosure have expressed concern that it is a little too light for their adult cats who may be strong enough to tip it over or force their way out of it. In actual fact, even though the enclosure is fairly light, no adult cat should be strong enough in order to tip the enclosure over or find a way out. So even though it’s weight can be a bit of a concern for some people, it should not be able to be tipped over by a large adult cat. This particular enclosure doesn’t technically have locks. It comes with secure latches that hold the door in place. Much like the mesh covering on the enclosure, the latches are fairly strong and secure so no cat should be able to get them off. If you are concerned about this, maybe try and reinforce the latches with some rope if you feel like it will give you a little peace of mind. This enclosure is able to cover quite a bit of floor space, so yes it should be able to accommodate two or three fully grown adult cats. If you have kittens however and you are trying to get them accustomed to being outside, then you might be able to fit in five or six of them. It all really depends on the temperament of your cats and how independent they like to be. If however you are concerned that the previous model we have looked at is too small for you and your cats, then this model should prove to be much more accommodating. This is an extra large model of cat enclosure, with two large shelters so then cats are able to get comfortable in the shade while the other cats are able to climb onto the next level using a small ramp. It is ideal for anyone that is looking to keep their cats entertained outside for a large part of the day. Because of the shelters and the general design of the enclosure, it also means that you do not need to be overly concerned if it starts to get cold or there are a few spots of rain in the air. Your cats will be able to keep warm and keep themselves out of the light rain until it passes. It may be light like the previous model we looked at, but it is still very secure and will keep your cats safe at all times. The two shelters that come inside the enclosure are fairly large, so the majority of fully grown adult cats should be able to fit inside comfortably without having to squeeze inside. Kittens will have plenty of room inside, to such an extent that two can probably fit into each shelter comfortably without having to get close together if they don’t want to. The particular enclosure has three access doors, which makes a lot easier to get your cats in and out without any hassle. All of the doors come with firm latches so then no cats are able to chew or scratch their way out. 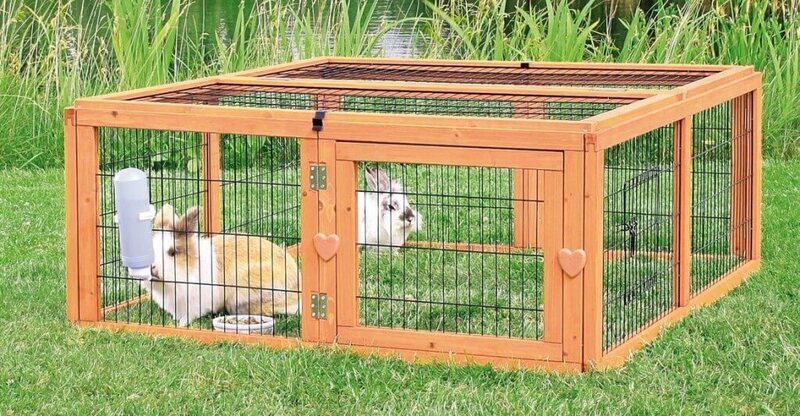 This is probably not just the most original cat enclosure available from Trixie Pet Products, but also one of the most original enclosures available anywhere on the market right now. Cats are able to access this house through a flap on the right hand side. Then they are able to climb up to the two other additional levels. This is a a great addition to keep cats happy. They are free to get comfortable or play inside the house without any disturbances from outside. The only real downside with this house is that it is quite thin, which means that some cats will find that they are not able to climb all the way inside and get comfortable on the top levels. 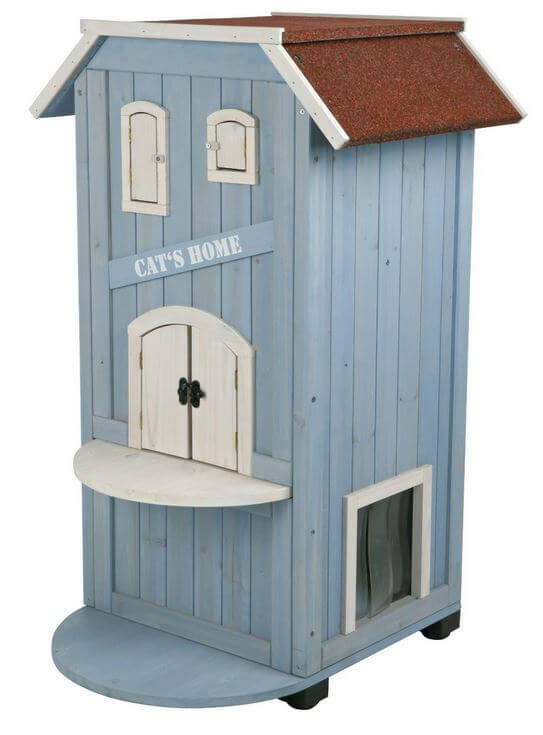 If you have a cat that you would consider to be large for a fully grown adult cat, then this particular cat house may not be for you. If however you have a few kittens or small adult cats, then they will able to enjoy this house and move around it with a great deal of freedom. While on the surface it does look like this house would be quite difficult to assemble, it is actually very easy to put together. All you will really need is a screwdriver and you should be able to put the whole thing together within an hour or so. The instructions that come with the enclosure are very clear so you can follow the directions clearly without any fear of confusion. No, this house does not have any isolation, but at the same time it doesn’t get overly hot or cold either. While it may be feeling a little cold outside, the interior of the house is able to keep relatively cool at all times. If you are concerned however that your cats will not be comfortable inside during the weather at that time, then you should take the cats inside and stop them from getting inside the enclosure. When it comes to cat enclosures, Trixie Pet Products certainly have some unique designs. Their outdoor cat house is one of the most original designs on the market right now, while their more traditional enclosures are safe, secure and allow cats to have a little more freedom while they are outside. 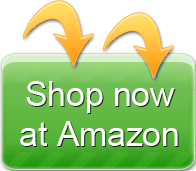 If you are looking for something that is a little different that will still keep your cats safe at all times, the Trixie Pet Products is a good place to check out.